Taiwanese Females = Universal Healthcare! 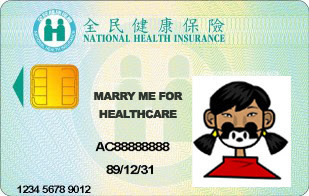 Q6: Are foreigners who marry Taiwanese females eligible for the NHI program? AHEM. Does that mean in order to qualify for universal healthcare foreign women would have to marry a Taiwanese woman as well? AS IF all foreigners were men marrying Taiwanese women. What? Taiwanese husbands don't qualify you for healthcare?